Limoncello is an Italian lemon liqueur which has been gaining popularity here in the states. 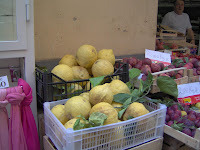 The drink is made from lemon rinds (traditionally large lemons from Sorrento, but most yellow lemons will do), alcohol, water, and sugar. It is bright yellow in color, sweet & lemony but not sour since it does not contain any lemon juice. Unlike many other liqueurs, limoncello is easy and inexpensive to produce, requiring only sugar, water, lemon zest, alcohol, and time to mature. Homemade limoncello often has a stronger, more pronounced lemon flavor than brands sold in stores. To do this, pure 96% alcohol must be used and it should be diluted only after extraction, as 40% vodka does not extract all the oil flavors from the peel. Different varieties of lemon are used to produce different flavors. The variety of lemon used is usually dictated by region. Various alcohols can be used to give distinct flavors. A higher proof alcohol maximizes extraction of the lemon flavor, whereas darker alcohols add complexity of flavor. Higher quality sugars used in the infusion process create a sweeter liqueur. Limoncello is traditionally served chilled as an after dinner digestivo. Along the Amalfi Coast, it is usually served in small ceramic glasses themselves often chilled, the Amalfi coast being a center of both ceramic and limoncello production. This tradition has been carried into other parts of Italy. We get a lot of inquiries for Limoncello in our stores. Unfortunaltely, it is a liqueur, therefore we cannot sell it. There are some wine-based limoncellos, but I do not recommend them. For those who like to create, I am providing here some recipes on how to make limoncello as well as providing multiple how-to videos. Read, watch and try. Pick the recipe you like best and make it your own. Salut! Wash the lemons thoroughly - scrub them clean of all residue. Using a peeler, take off the skins being careful not to get any of the white lemon “pith” onto your peelings or it will add bitterness to your limoncello. Put the peels into a large, open-mouth jar with the alcohol and seal the lid tightly. Put the date on the bottle. Put the jar in a cool, dry place for one week - once a day, shake the contents well to remix everything. You’ll notice the color of the liquid changing to yellow and the color of the lemon peels fading. One week later, dissolve the sugar completely in water by heating it on the stove. Then cool the sugar-water mixture to room temperature. Strain the lemon peels out of the alcohol and then mix the alcohol with the sugar-water. Usually the color of the alcohol changes from clear yellow to cloudy yellow when it’s combined with the sugar-water. I'd never heard of Limoncello before moving to New Zealand. We've got a neighbor here who makes the BEST Limoncello ice cream, from her own homemade Limoncello. I love this stuff. Hope to receive an answer to my question. . . . Prepared the lemoncello recipe from memory. Just realized (too late) that I added the sugar/water syrup to the vodka and rindes all in one step. Will it still infuse? Is this ruined? Will it spoil?